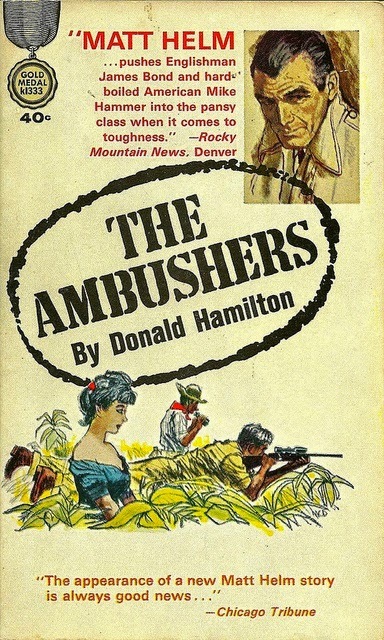 The Ambushers (1963), sixth of Donald Hamilton's many Matt Helm novels, is a weaker book than his non-series Line of Fire, in part because two, and perhaps all three, of its last-chapter plot twists seem arbitrary. One of these is arguably out of character for a competent hit man/espionage operative of the kind Matt Helm is supposed to be. Still, the two books got me thinking about how badly Sylvester Stallone. Chuck Norris, and Steven Seagal have damaged the reputation of the men's adventure story, specifically the kind whose protagonist is a veteran. Lazy liberal that I am, I had come to regard the genre, rightly or wrongly, as a field where lazy right-wingers could live out action fantasies they would never come within a million miles of in real life. From the other side of the political spectrum, I'd begun to fear that any story featuring a veteran was thin disguise for anti-war polemic. Paul Davis, a few years older than I am and a veteran, has given me a schooling on the shifting depiction of Vietnam veterans in popular culture. For Paul, the Tom Selleck TV show Magnum P.I. marked a turn away from depictions of Vietnam vets as damaged psychopaths. And my recent reading has convinced me that thrillers and adventure novels need not be marred by polemics, whether from the left or the right, just because their protagonists are veterans, at least not if the writer is as good as Donald Hamilton. Of course, the two Hamilton novels I have read recently appeared in 1955 and 1963. I will be eager to see if the political tone changed in the Helm novels that appeared after public anger against the Vietnam Wat began to build. I'm reading a novel by a Vietnam vet right now, Tom Crowley, who I met at Bouchercon. His character is a vet from Iraq and Afghanistan and he is a disillusioned person, but he's a park ranger in Thailand, not a psychopath. Maybe Crowley heralds an era of realism in genre writing by and about veterans. Interesting that the character and the author fought in different wars. I see that his character's name is Matt Chance, a good, two-fisted name for an action hero and, possibly, an homage to Donald Hamilton's Matt Helm. Yes, although he's half Thai, half-American, so he's more complex than I have represented him so far. Or half-Asian, at any rate. I don't remember if he's part-Thai. Yes, I was thinking that Hallinan's character was part Thai too. I think it's just a helpful strategy if you're writing a series in that part of the world. Crowley lives in Bangkok but though I know he knows of at least some of these guys, I didn't have the sense that he hung out with them. Andrew Nette, who lives in Melbourne and knows Adrian McKinty and who has spent time in Southeast Asia, knows some of that gang of writers. (Andrew attended this year's Noitrcon, shortly before Bouchercon.) I get the idea that that's a small group of writers in Thailand and that they know one another, or at least have read one another's work. Wasn't Dean Martin the Matt Helm in the movie versions? Now that is just weird! R.T.: Yes, he was, and by all accounts, the movies have little to do with the novels on which they are based. The Ambushers contains just the barest hint of the wisecracking spoofs, a la Bond, that I think the movies became. I have the impression that Crowley is pretty much off doing his own thing. His first book was a non-fiction book about playing pool in a Bangkok brothel. The writer he expressed admiration for was actually John Connolly. I read a bit about him. He appears to have chosen an interesting post-military, post-businesses occupation. And his Amazon page says he likes "the writing of both Connellys, Michael and John," which would work better orally than in print, because Michael spells his last name Connelly. Yes, he seems to have led quite a varied life, and was a nice person, too. Somehow I expected that. I may have a look if I continue this current preoccupation with thrillers and adventure stories. I'd like to see what form disillusionment takes these days. Being about fifty pages in, I can say that he is anc intelligent writer. And speaking of writers at Bouchercon, I looked in the book bag they gave me to refresh my memory of the contents and it turns out that one of the books was by none other than Bob Truluck. Aha! I don't think I got any of Truluck's books in my bag. I paid for the one I have. In re disillusion, given what I am reading now, I'd look out for how Crowley has his protagonist handle post-military life. I wondered how varied the bags might be. I was pretty happy to have all I got, though I knew none of them, but I wondered how picky others might be of this, in my view, treasure trove. Conventions, including this Bouchercon, set up a book-swap table for attendees to leave (and take) books from their and others' bags. Ali Karim and his gang, including me, had great fun with a series of cat books that turned up in many bags. I was one of the few who got Stable Cat in mine, to which I replied on Facebook that I would have preferred Unstable Cat. I was pretty happy with my bag, although I haven't actually gotten to any of the books that were in it yet. I just found a book I want to buy, but I'll have to wait til I get home and make sure I did not get it in my bag.